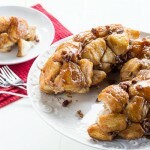 This Monkey Bread is super easy to make with refrigerated biscuit dough. 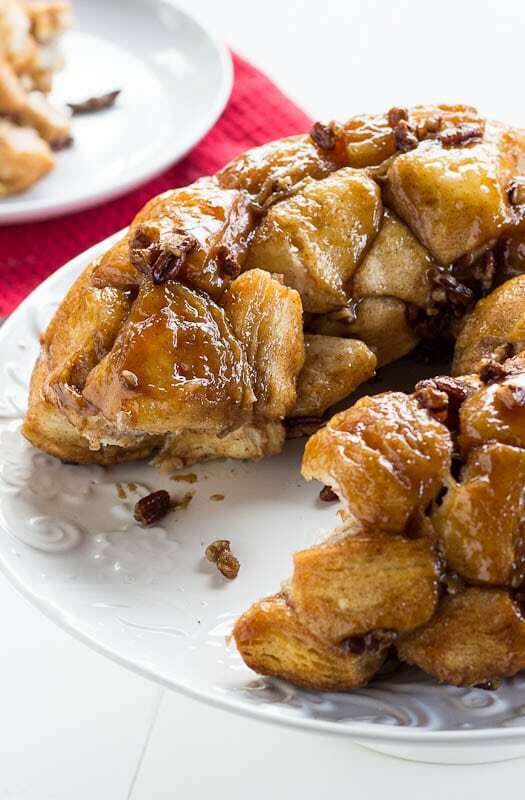 A mixture of melted butter, brown, sugar, cinnamon, and pecans makes it so gooey and good! My husband doesn’t cook much, but every Christmas morning he makes Monkey Bread. He’s tried a variety of recipes over the years, some using frozen bread dough and others, like this one, that use refrigerated biscuits. Years ago he made one with butterscotch pudding mix. That one was outrageously good- except for the year he mistakenly bought sugar-free pudding mix. 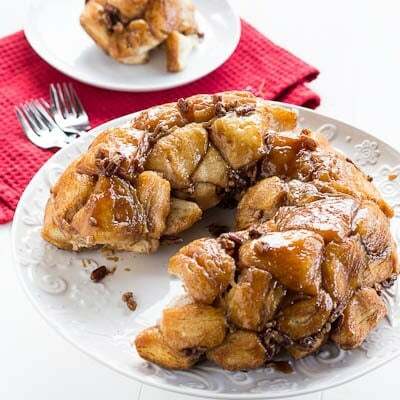 Monkey bread is a wonderful sweet treat to have around on a cold, wintry weekend like we’ve had this weekend in South Carolina. 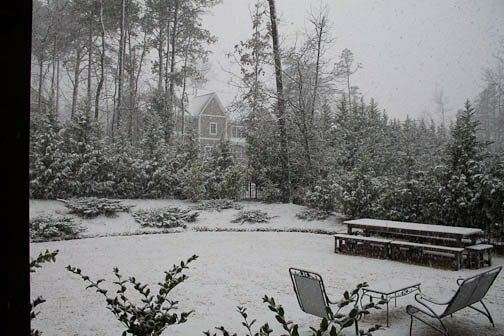 Out of nowhere, we had our first and maybe only snow storm of the winter late yesterday afternoon. Just hours earlier, it was sunny and fairly warm. I love it when it snows in our neighborhood. We live in a golf-course community, and after a snow storm is one of the few times the golf course is closed and we can take a walk on it. It’s like seeing a part of the neighborhood we never get to see, but that is just yards from our house. The trees look so gorgeous all covered in white. It’s a hilly golf course and the neighborhood kids love to sled down the hills into the sand traps. After an hour or two spent outside, during which the hands have gone numb and the nose has turned red, it’s so nice to come back in the warm house, sit by the fire, and sip some hot choclate and munch on some Monkey Bread. Whenever we have Monkey Bread in our house, it gets placed on the counter in the morning and stays there all day for anyone who wants to munch on it at their leisure. By late afternoon, there are usually just a few crumbs left on the plate and maybe a pecan piece or two that got a little too browned in the oven. Note: You could easily switch out the pecans for walnuts if you prefer, or add in some raisins, chocolate chips, or even butterscotch chips. 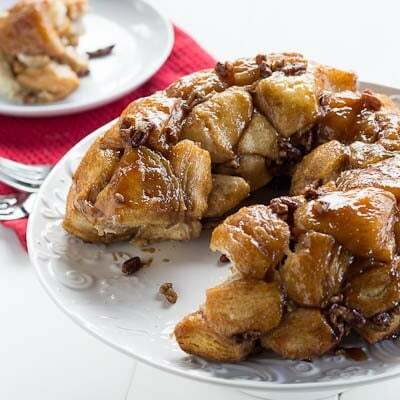 This easy Monkey Bread is made from refrigerated biscuits. Perfectly gooey and sweet with the buttery crunch of pecans. Heat oven to 350 degrees. Lightly grease a Bundt pan with butter. In a large ziptop bag mix granulated sugar and cinnamon. Cut each biscuit into quarters. Place in bag and shake to coat. Place in pan, scattering pecan pieces around biscuits. Mix brown sugar and butter in a small bowl. Pour over biscuits. Bake 28 to 32 minutes or until golden brown and no longer doughy in the middle. Cool 10 minutes. Invert onto a serving plate. This entry was posted in Breads and Muffins, Breakfast and tagged biscuits, bread. Bookmark the permalink. This is an awesome receipt. Can this be cooked in a regular pan?? I do not have a bundt pan! Help! You can try cooking it in a bread pan. Or a cake pan, but it will be much thinner and the middle might be a little underdone. Your monkey bread recipe turned out really yummy. Super easy! I did soak some raisins in vanilla and shake them in the leftover cinnamon sugar and spread them over top before baking. I love your new site and all your recipes so far look fabulous. 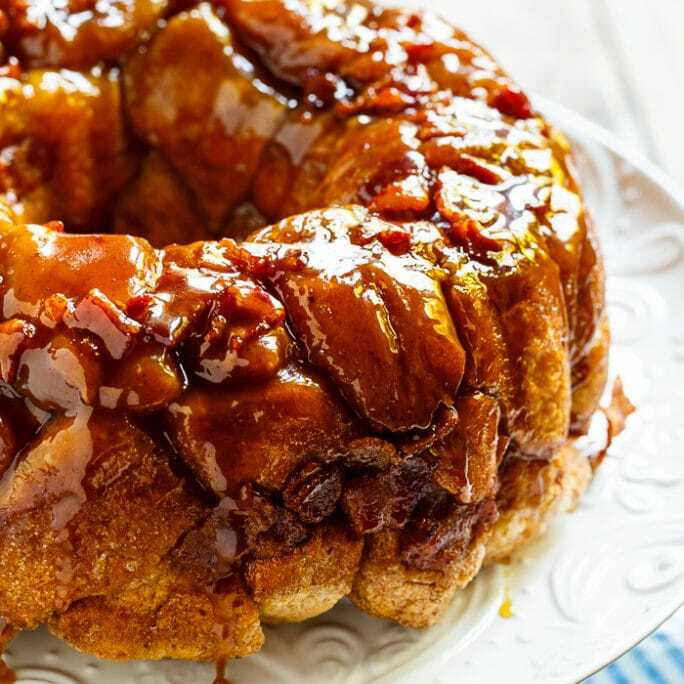 I have never had monkey bread and it seems to be a pretty big thing around here. So I think I’ll just have to start with your recipe! Thanks so much Kendra! 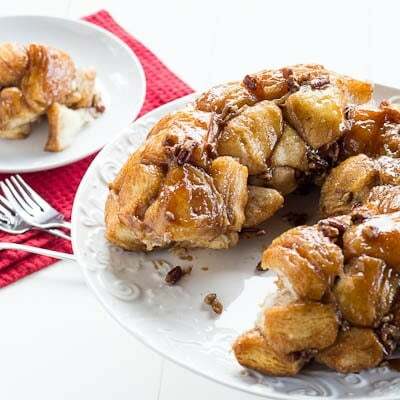 You’ll love monkey bread and it’s so easy. I am really tempted to try monkey bread, but still didn’t find time to do it. Looks really yummy! This is such a quick and easy recipe!